I love winter and the snow, but I still look forward to spring too. I decided to make a bright and cheery journal page this week. 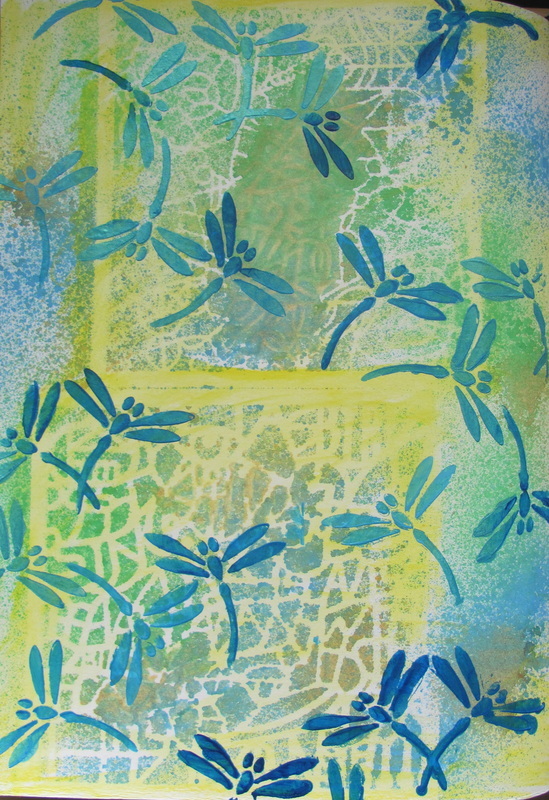 It is nice to warm up by thinking about the flowers and dragonflies coming back to the cold north. I started by spraying homade spray paint through the Bird and Gera stencils from the TEXTures 2 series. These stencils remind me of the warm spring that will come. I used green, blue, and yellow sprays. 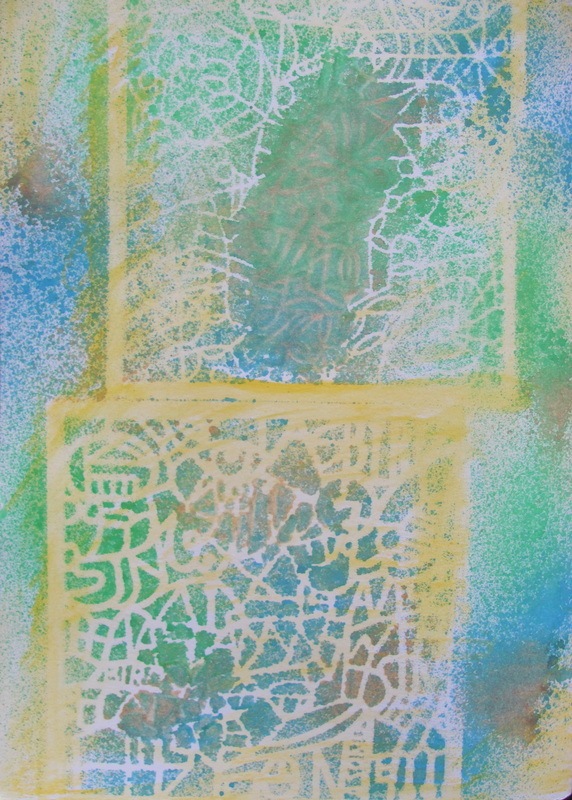 I used a Caran d'Ache Neocolor II Artists' Crayon in yellow to fill in some of the white areas. 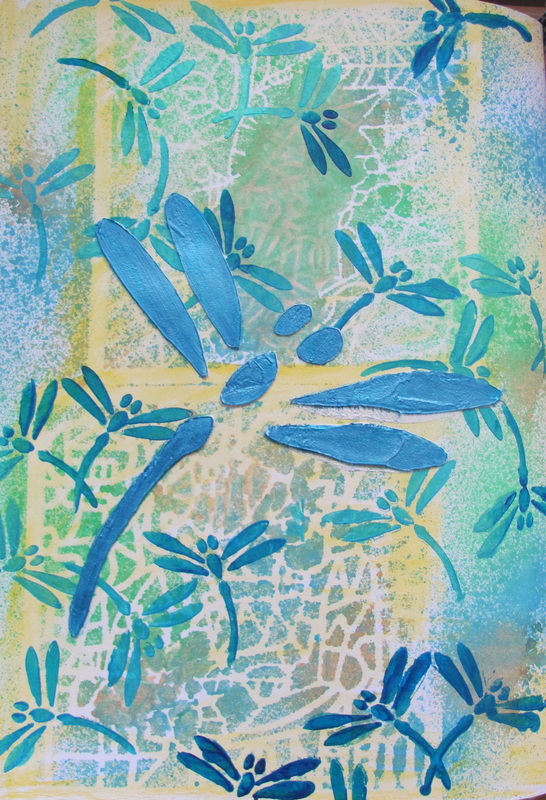 I used the Dragonfly stencil to add dragonflies over the page in shades of blue. 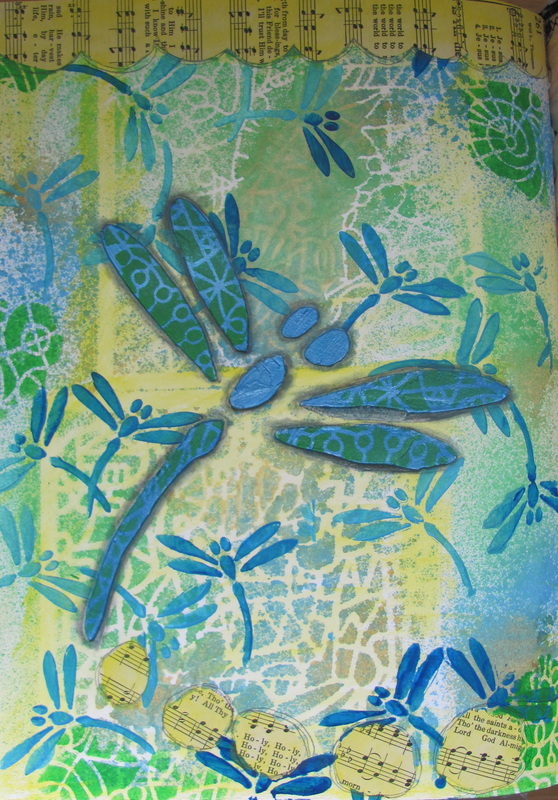 I copied one of the dragonflies from the stencil and enlarged it. 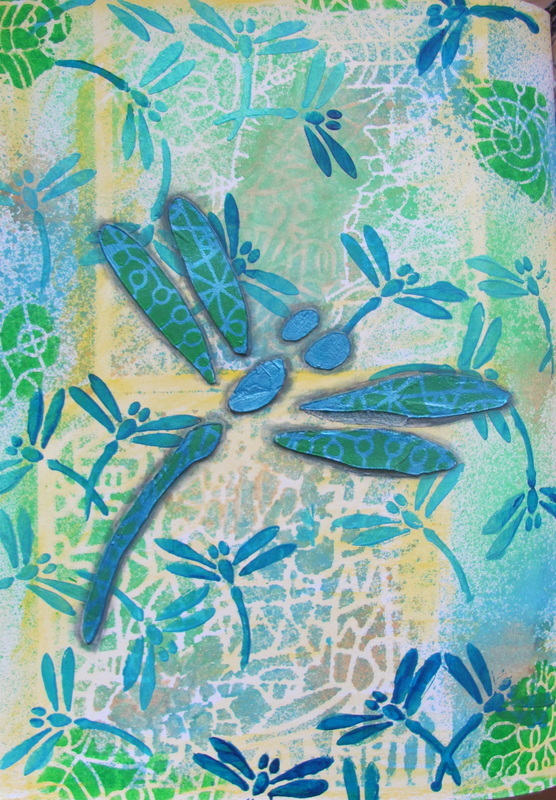 I cut a stencil of the enlarged dragonfly out of chipboard and added it to the page with modeling paste. 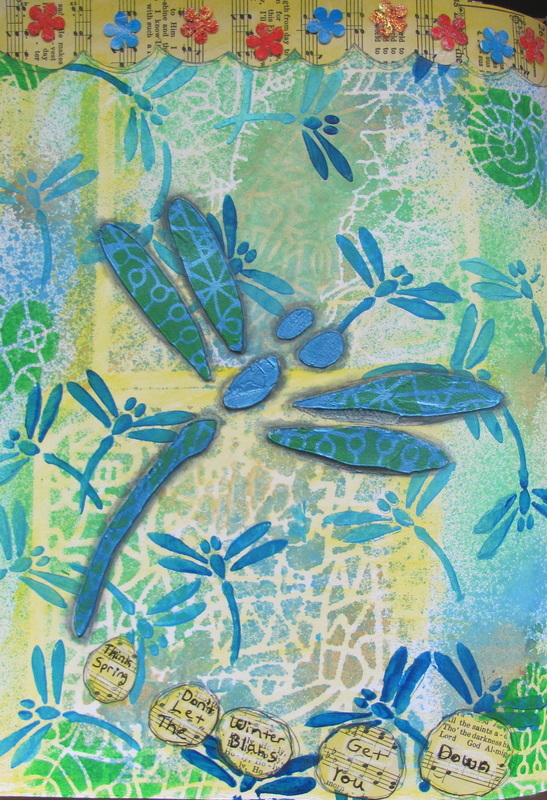 After the modeling paste was dry I colored the dragonfly with Viva Decor Inka Gold in steel blue. 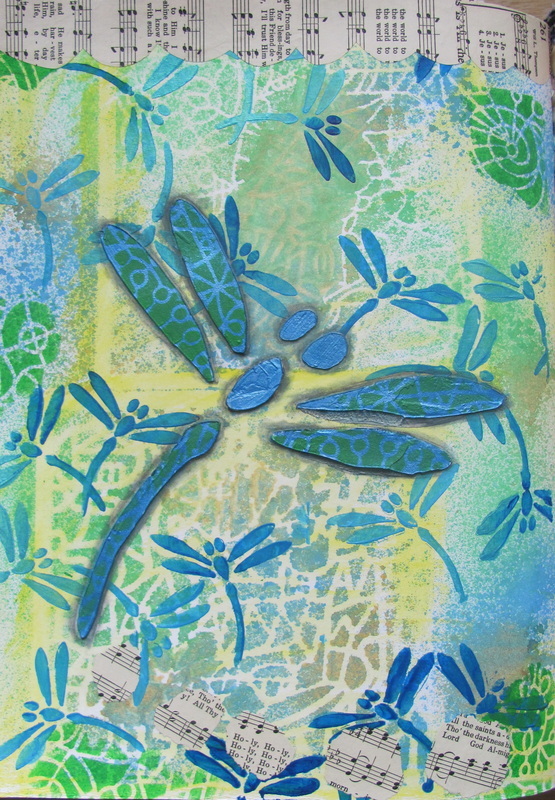 I used the Gera stencil to add details to the dragonfly with green paint and I also added designs with the same stencil around the page. I added a shadow around the large dragonfly with a charcoal pencil. I cut some bubble shapes from a sheet of music and also a banner for the top of the page. I glued these down with fluid matte medium. I added yellow to the music paper with the same neocolor crayon that I used earlier. I also added some sketchy lines around the bubbles and along the scallops. I had some flowers punched out of my painted papers and a sheet of melted Glitterati fibers. I added these flowers to the top border to give the page a pop of color. I added a hopeful message to the bubbles. Think Spring Don't Let the Winter Blahs Get You Down. I hope that this page reminds everyone living in the cold regions of the world that spring and warmth will return.